Since I wasn't in the Smokies as I originally intended, I decided that chasing some bluegill and bass late in the day would be a good idea. The small lake nearby that I like to fish had several other people out fishing on it but there were still plenty of good spots to work. My favorite area was deserted so I worked my way over. After catching the bass, I started working back towards the car. There are lots of bluegill in this particular lake so I decided to try and catch a few. I tied on two flies, the second of which is one of my most deadly bluegill flies. I've mentioned this fly before but it is well worth mentioning again. It is the Simi Seal Leech and I was fishing a size #16 with a small beadhead in purple. I finally hooked one and for a second thought that maybe a bass had taken the first fly in the two fly rig. However, when I got it close, I saw it was indeed a bluegill and it had taken the small leech pattern. This was one of the fattest bluegill I've ever seen and it fought really well... That fish really made my day. I caught a few more smaller bluegill and sight fished over a bass for awhile, changing flies several times, but he was on to me and wouldn't eat. Today I'll probably tie a bunch of flies and start planning for my potential trip out west. I've got to do some research on different rivers I hope to fish, fishing license fees, camping fees, and lots of other things. Also, I might try to get a little more time in today fishing...check back to see if I catch that big bass! For the last few weeks I've been looking forward to a backpacking trip in the Smokies. The upper Little River watershed is one of my favorite areas to fish, not so much because the fishing is great as because it is really where I learned to fly fish. My plans for this trip included 2 nights at backcountry site #24 and then up the trail to #30 for another night. I intended to hit Fish Camp Prong and upper Little River over the course of 2-3 days of fishing. Heading up to the park Wednesday afternoon, I stopped by Little River Outfitters to pick up some tying supplies (thinking about West Trip 2009). After chatting with Byron Begley for awhile, I headed on towards Elkmont. After filling out my backcountry permit, I took off up the trail. There were only two hours of daylight left and I wanted to get into camp and have time to eat supper before dark. I made it in plenty of time and after eating supper went to bed. Sleeping right by the creek is extremely peaceful and relaxing. The sound of a rushing mountain stream is one of natures most soothing sounds and I enjoyed it to the fullest. Thursday morning I woke up ready for a long day of fishing. As I ate breakfast, I contemplated about how much money it takes to get started backpacking. While I don't have great gear, it still represents a decent investment monetarily and I thought about how terrible it would be if someone took all my gear. I never even thought about Mother Nature destroying anything. After breakfast I was ready to go. Day one was going to be Fish Camp Prong and I hoped to get the Smoky Mountain slam of a rainbow, brook and brown. The lowest stretch of the stream is the place to catch brown trout so I started there, working my way up slowly from Little River. Things started out a little slow, but finally I picked up a rainbow on a Tellico nymph. Little Yellow stoneflies started making an appearance and I decided to try a Neversink Caddis. This proved good for several fish including a nice brown that ghosted up out of a deeper run to inhale the fly. After catching the brown, I got back on the trail and started walking to get into brookie territory. I've caught brook trout within a mile of Little River but they seem to be a bit scarce in the lower sections. Finally I got tired of walking and decided to try my luck. As I moved up the stream, the fishing continued to be very inconsistent. It seemed that every run, pool, and pocket required a different fly. 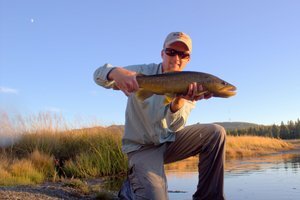 I would catch a few fish on one fly only to have it seemingly quit working. Different sections of the stream had different bugs hatching and overall it seemed that a Parachute Adams or Neversink Caddis was a fair representation of most of the adult insects. 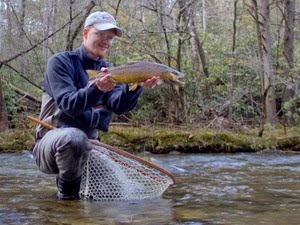 I fished a double nymph rig as well with a Tellico and one other nymph. After several rainbows, a brookie finally took one of my "secret" soft hackle patterns fished deep as a standard nymph and the slam was complete. I was fishing through a bit of a gorge and fished until I thought I could scale the high bank back to the trail. Back on Little River I decided to fish up from the Goshen Prong trail bridge to #24. 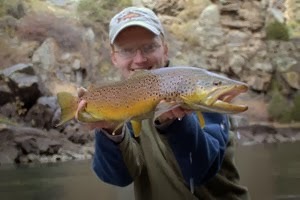 Here the dry fly fishing really picked up. I fished a Parachute Adams for awhile and then switched to a yellow Neversink. The fish liked both equally well it seemed and I caught several nice rainbows and one more brown. After what seemed a short distance, I saw my tent and decided to call it a day. After taking in the whole situation, I decided it would be in my best interest to pack everything up and head out. I would have to really hustle because it would be dark soon. I got everything in my pack and hit the trail by 7:30 Eastern time. One hour later I had made it back to my car. Shortly after leaving camp, probably about 300 yards below #24, I saw a fairly large bear feeding near the trail. I clapped to try and scare it away but it just stared back at my completely unconcerned. Bears without fear always make me nervous and I was glad that I was heading out for the night. On the way back down I ran into a guy from the Wildlife Division who was out hunting wild pigs. I told him what had happened and he asked for my name and phone number so he could do a bear report. He mentioned that #24 would probably be closed in the next day or two. Overall I had a great trip. The fishing was good although I can't quite call it great. I caught a lot of fish but was working a little harder for them than I sometimes have to. There is even a blessing in disguise about my tent being ruined. I could have been in the tent or in camp when the bear decided to show up or it could have more thoroughly destroyed my tent. While the tent won't work for camping anymore, it could have been much worse. The bear could have shredded it and then got the sleeping bag and thermarest inside. That would have made things even worse for me. Replacing a tent is bad enough, but the rest would have been very hard to do anytime soon. Our latest poll ended yesterday and it looks like the majority of you either use Orvis or Rio tippet products. Lots of others with a loyal following as as but it looks like those two are the favorites. Personally I've fished Orvis Super Strong for years but lately have switched over to Rio. I'm not really sure if I'll stick with the Rio or not though because it feels just a little stiff in my opinion. I do like the Rio Fluoroflex Plus and use it in place of my favorite but more expensive Seaguar Grand Max FX. For those that haven't made the switch to fluoro for some of their fishing yet, give it a shot. I can honestly say that I feel I land many more fish because of the fluorocarbon tippet used. The "invisible" effect is not really the main reason I fish it. Instead, I feel much more confident that nothing is going to break when I hook that nice fish. Mono tippet seems to break so much easier, and I can pressure fish a lot more with fluoro tippet meaning it is possible to land those large fish much quicker. This is important anytime you intend to release that nice fish which I always do. Finally, the water is getting warm enough that the bass are getting active. I made it out with my new Elkhorn reel and sinking line to throw streamers. After lots of follows and short strikes, a fish finally made a total commitment. After posing for a picture, the fish swam off to keep growing. Alrighty folks! Its that time of year when TWRA is soliciting comments from anglers who fish in Tennessee. You can simply take a few moments to send an email with any suggestions that you might have for improving any of the fisheries in our state. 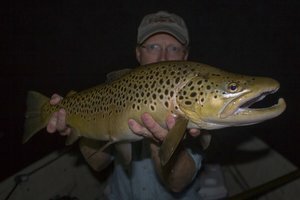 -Increase the number of trophy browns in the river with either a slot limit (i.e., 16"-22" like they have on the SoHo) or increasing the minimum size limit to 20" or 22". -Increase the retention of trophy fish by either limiting fishing during the spawn or requiring catch and release (I realize that these are not likely but its okay to wish). -Adopt a minimum size or slot limit (preferably the slot) on rainbows. -Increase enforcement on the river, especially during the spawn when the large fish are so vulnerable. If you fish the Caney and want to see more and healthier big fish, please let TWRA know. I'm in no way opposed to folks taking a few home but it would be nice if they are taking home fish that are a little larger so there are plenty of 18"-24" fish in the river. This river can support a lot of very large browns if we just release them until they have grown sufficiently. There are plenty of rainbows for those that want smaller fish to eat. Thank you to everyone that cares about our rivers, lakes and streams and takes time to offer comments on improving these fisheries! In my opinion, the largest difference in fishing ability is strictly a result of persistence. Perseverance is what separates the men from the boys, the posers from the real deal. Those that put in their time learning a stream and how to fish it are invariably the most successful fisherman. My buddy Joe Mcgroom is one of the most dedicated fisherman I've ever met. He will spend as much time looking for fish as he does actually fishing, sometimes even more. When we fished together and he finally caught the nice 13 inch brown on Little River, I got to watch him in action and see how he would approach a difficult fish. I spotted the fish in the same position as the last time I missed him. After rigging up my nymphs, the fish started to rise periodically. I switched to a dry but was unable to get him to eat anything. It snowed the whole time on me, and my hands were going numb from changing flies so often. I tried just about every nymph and dry in my box until he finally rose to a small, dark dry fly. After several tense jumps and a brief run, I netted the fish, took a couple pictures, and released it. The second and feature day of our weekend trip was to fish a special section of Deep Creek. We intended to do some hiking and fish a section that is a favorite. The main wrinkle in our plans was the cold night temperatures. First thing in the morning I took the water temperature at the Deep Creek Campground. The chilly 43 degree reading had us extremely nervous about the prospects for the day. Cold water is not necessarily bad for trout. A lot of people think that the fishing is bad once the water temperature is too low but this is not quite an accurate generalization. The real detrimental factor is a huge fluctuation in water conditions, whether it is changing water levels or a large change in the water temperature. Rising water temperatures are often good early in the season but a large drop in temperatures can put the fish down. Despite the cold start, the forecast high was in the upper sixties under mostly sunny skies. We started the day hiking in to where we wanted to fish. On the way up we stopped at a couple of spots to see if the fish were active yet. Large numbers of midges were on the water, but the fish did not seem interested. Considering the hike, we were a little nervous about the overall fishing for the day but hope springs eternal and we pressed on. Finally, we found what we were looking for. A beautiful stretch of dry fly water was just begging to be fished. At our last stop I had tied on a pair of nymphs but the sight of such nice water quickly convinced me to tie on a dry. The fly of choice was a #16 parachute Adams. I slowly worked my way into a nice shallow riffle but could not get a rise. The deeper part of the run looked good with a midstream boulder creating a perfect pocket. My first cast was too close to the faster current but the second one was perfect. The fly slowly danced tantalizingly in the dead water behind the boulder and then it happened. A dark shadow materialized from the depths and inhaled the fly. The hookset was perfect and a nice little rainbow was dancing on the end of my line. At this point in the day, we were both quite relieved to see a fish so we took the necessary “first fish of the day” pictures and then watched the fish dart back to the bottom. Moving upstream, we saw a few more fish but none of them seemed particularly enthusiastic. Good numbers of bugs were hatching, most notably several large Quill Gordon mayflies. Rummaging through my box of dries, I found the perfect match and tied it on. Immediately the fish were all over it. I couldn’t keep the fish off. As we continued upstream, I caught lots of fish while Joe was struggling to get any to rise. Finally I offered to give him a fly like I was using and that did the trick. The fish were keyed on Quill Gordons. The rest of the day was spent tossing big dries to hungry fish. Over the course of the afternoon we both lost track of how many fish we caught but agreed that it was plenty. The biggest surprise of the day was that the majority of the fish we caught were brown trout. 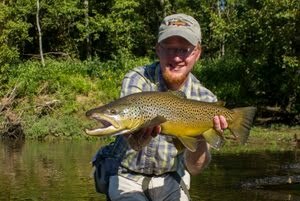 I always catch plenty of browns on Deep Creek but normally they aren’t the majority. This made the day even more special. The final pool of the day was the same place that I caught my nice 19.5 inch brown last summer. I was really hoping to find this fish again since it should be over 20 inches by now but it didn’t want to come out and play. We were both tired from the hike and our feet were a little sore because we wore our wading boots for the hike up. It had been a perfect day of fishing and we weren’t going to push our luck. Upon arrival at Deep Creek, I immediately strung up a rod and headed out for some fishing. The opportunities were somewhat limited early in the trip since the creek was up due to the recent rains. My buddy Joe Mcgroom and I headed up stream from the campground to a certain pool that we wanted to fish thoroughly. The first item of business was to look for nice fish. Higher water levels often bring the big fish out to play so we were hoping for something special. Unfortunately it was not meant to be. There were lots of fish feeding but nothing unusually large. I headed up stream a little ways and found some beautiful pocket water that yielded the first fish of the trip, a chunky rainbow. As the sun sank lower in the west, we headed back for camp and a warm meal, anticipating the next day’s fishing.